What is the origin of the Hokkaido Dog? The Hokkaido dog also known as the Ainu-ken, Seta and Shita is considered by many the oldest and the “wildest” of Japanese dogs. The Hokkaido dog is believed to have breed by ancient Japanese hunters known as the matagi, to hunt bear and deer. The Ainu people, the indigenous people of Japan, brought the Hokkaido to the Tohoku region Hokkaido prefecture of Japan. In the 1930s the Hokkaido dog was designated as a rare species protected by the law. What does the Hokkaido Dog look like? The Hokkaido dog is a thin, muscular and sturdy dog. Hokkaido’s have small, erect ears and small dark brown triangularly set eyes. Their physique enables them to withstand severe cold and heavy snowfalls. Some Hokkaido’s have spots of back on their tongues. The Hokkaido has two coats of fur. The top layer is made of long stiff fur; the bottom is of shorter softer fur. Coat colors are usually red or white, however some may have black, wolf-gray, sesame, and brindle. 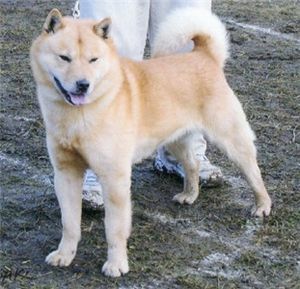 Hokkaido’s are a medium sized dog ranging from 18-22 inches (46-56 cm) tall and 45-65 pounds (20-30kg). 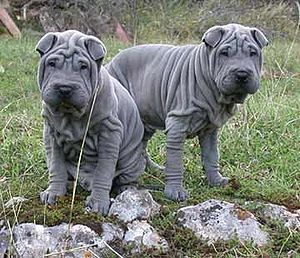 The average life span for this breed in about 11-13 years. The Hokkaido dog, like many other dogs, follows a plain diet. Puppy Hokkaido’s need about a half a pound to one pound (200-500 grams) of dry dog food per day divided into about 2-4 feeding per day, and the adult, double that. The long double coat of the Hokkaido should be brushed on a regular basis. What is the temperament of the Hokkaido Dog? The Hokkaido is always alert, and curious making them an excellent watch dog. In addition to being an excellent watchdog, the Hokkaido is fearless and extremely loyal to their owner. The Hokkaido dog has a keen sense of direction and can return to its owner no matter how far away they are. Hokkaido’s are gentle, obedient and very. loving. When training the Hokkaido one has to be firm and fair. They do not respond to heavy-handed training. Owners must display pack leader qualities or else the Hokkaido can become headstrong, stubborn and aggressive towards other dogs. 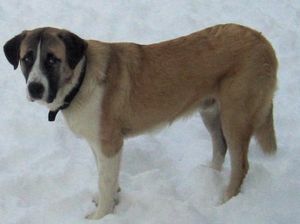 This breed is good with children if they are raised with them as a puppy. Children should be taught how to display leadership skills toward the dog and the dog should be taught how to respect the child. Balance is key when training the Hokkaido dog. The Hokkaido is not recommended for an apartment lifestyle. 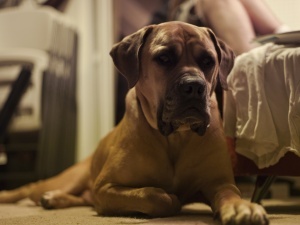 This dog is moderately active indoors and will thrive with a large yard to play in. They were bred to live outdoors as their coats are thick to protect them from the cold. The Hokkaido needs moderate regular exercise to stay in shape. Long walks are highly recommended. What is the Hokkaido dog used for? The Hokkaido is always alert, and curious making them an excellent watch dog. In addition to being an excellent watchdog, the Hokkaido is fearless hand extremely loyal to their owner. The Hokkaido dog has a keen sense of direction and can return to its owner no matter how far away they are. Hokkaido’s are gentle, obedient and very. loving.